When your best friend, when your ONLY friend, is dying, what else are you supposed to do other than make a wish for him to get better. So when Lottie finds a strange girl in her bedroom offering to take her to medicine that can cure anything, Lottie follows. She follows down through the roots of an apple tree into another world filled with magic, adventure, treachery, and the chance to save her best friend. This debut novel contains a charm reminiscent of The Lion, the Witch and the Wardrobe. It’s a fun surprising adventure about the realities and importance of friendship, with a little magic thrown in. The beginning is a bit heavy in descriptions that slow the pacing, and the author can get caught up in metaphors. However, Ormsbee has painted a world for us, and the writing is lush and vivid, and matches the “taste” of the story. The cast of characters are endearing, and well-rounded with each trying to work through issues (Lottie has to break through her innocent self-absorption, Oliver is painfully shy, etc. ), and they complement each other as a whole. The ending perfectly sets up for a continuation of this story without leaving the reader on a cliff. Overall, it’s an optimistic, fun, magical book that I think older children, and adults, will all love. I hope there will be more. Finn doesn’t know who his parents are, or even if he ever had any. All he remembers is waking up inside the terrible prison of Incarceron, a prison so vast it seems to be a world all of itself. Finn doesn’t know how he came to the prison. The one thing he does know, is that he doesn’t belong here, and unlike all the other prisoners, he’s certain there was a time when he wasn’t inside Incarceron. And that he must escape. But there is no escape from Incarceron. The prison sees to that— because Incarceron is alive, with a mind of its own, and eyes that watch his every move, and powers that defy understanding. Claudia knows who her parents are (or were). She knows where she is and who she is. She is the daughter of the Warden of Incarceron, the mysterious prison which no one has ever been to and no one can find, except the Warden. Claudia may not be imprisoned, but her life is far from free. Her entire future has been planned out for her, from birth on. She has been promised in marriage to the heir to the throne, to be the Queen of a rather odious future King, and the pawn of whatever power game her cold and sinister father is playing. Claudia’s desire to escape is every bit as strong as Finn’s—and to do it, she knows exactly what she needs to do: find Incarceron and fling wide its hidden, impenetrable doors, sparking a revolution. But neither escaping from or finding Incarceron are going to be simple tasks; indeed, they may both be impossible. 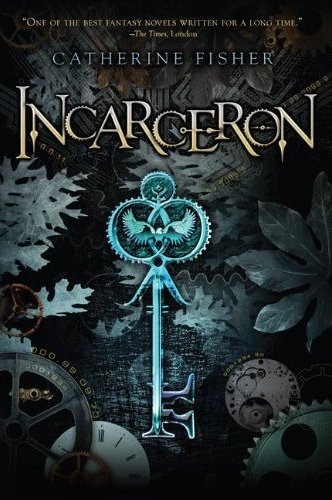 Because Incarceron is not what it seems to be, nor what it was meant to be, and the secrets behind it all are beyond either Finn or Claudia’s wildest imaginings. Part fantasy, part science fiction, Incarceron is a grand adventure inside (and outside) a fantastic world unlike any other. Full of twists and turns and unexpected revelations, it’s a book that’s as hard to predict as it is to put down—you may guess some of Incarceron’s secrets, but you won’t guess them all. And unlike Finn, once you enter Incarceron, you won’t want to escape. Shadow Moon, just released from prison, accepts a job from a shady character named Mr. Wednesday, and becomes involved in a battle for America. The gods from the old world, who came to America with emigrants from all over the globe, are fighting for prominence against the new gods of technology, which they see as ruling over American life. As Shadow gets pulled further into the struggle, he ends up on a very strange road trip, meeting gods from all over, trying to figure out what is really going on. American Gods is an interestingly layered book with the battle of the Gods theme utilized to tell multiple shorter stories as Shadow travels in America on his job. There are several vignettes and short stories of varying lengths about the deities as they have coped with the changing times that will delight readers with humor and chills. Shadow has his own story as the hero of the book who goes from tragedy to triumph. Mr. Gaiman, who now lives in the United States, won both the Hugo and Nebula Awards for this novel. Last year he received the Newbery, Carnegie, Audie, and Hugo Awards for his novel The Graveyard Book.